Friday night's matchup between the Sioux City Musketeers and the Lincoln Stars at the IceBox was postponed due to an on ice issue. 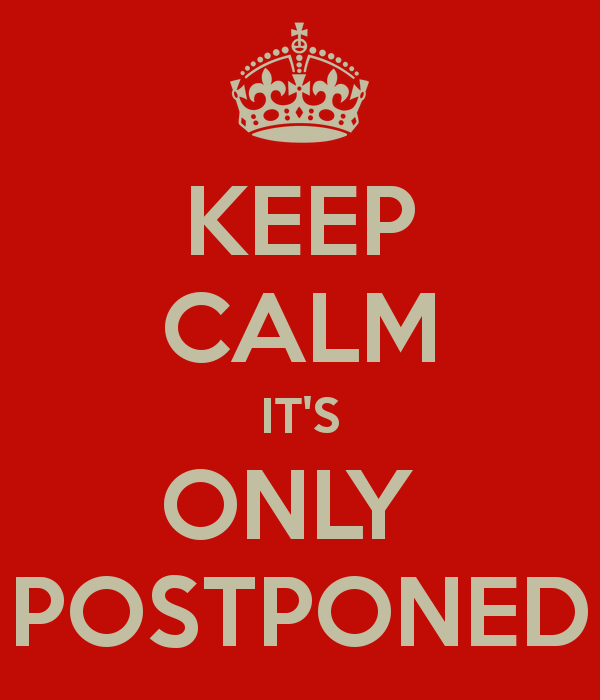 Click here to read the official response to the postponement by the Lincoln Stars. I wasn't at the game (battling a cold), but a friend who was there told me that it appeared a staff member accidentally nicked one of the glycol coolant lines underneath the ice (and concrete) when drilling a hole for one of the goalpost pegs. The IceBox rink staff had to first chip through the ice, and then chip through a layer of concrete below the ice before they could get to the glycol coolant line to repair that. Once that leak was repaired, they had to fill in the concrete hole and then try to get the ice to build up again. 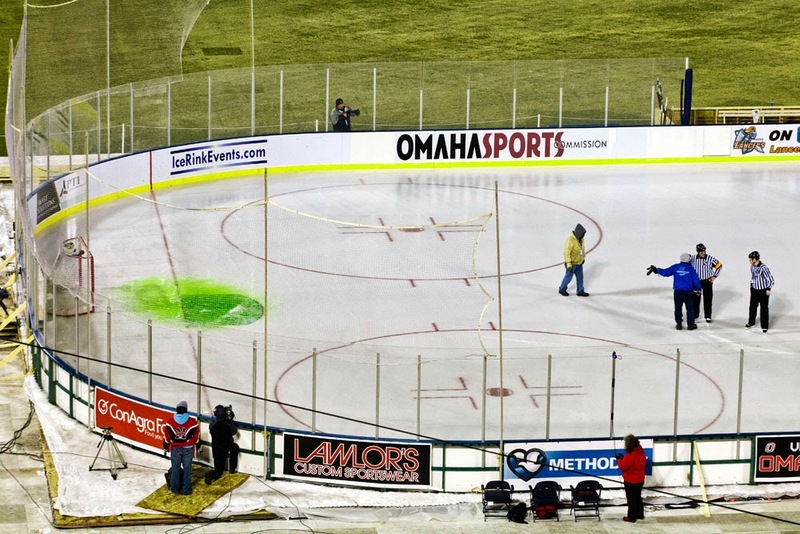 For those of you who attended the "Battles on Ice" outdoor games last year between the Stars-Lancers and UND-UNO, you'll remember that the same thing (sort of) happened up there. During the first intermission of the UND-UNO game, someone nicked the glycol line under the ice, which caused a long delay (picture of the leak below). That repair was much easier to fix because there wasn't a layer of concrete below the ice. Try as they might, the ice rink staff at the IceBox just weren't able to get the patch of ice above the leak solid enough to safely play a game. At around 7:30pm, the announcement was made inside the arena that the game would be cancelled and played at a later date. That date has yet to be announced. I'm sure the Stars feel terrible about this, but accidents happen. From what I was told by people in attendance, the ice rink staff really worked hard to get it fixed. If you were there last night, I hope you kept your ticket stub because you'll likely need it for when this game is eventually played. I would assume this game will be rescheduled for a Sunday, or weekday night (not a Friday) sometime in the future. Unfortunately, this means the Stars will only play one game for the third straight weekend. Tonight the good guys will be in Des Moines to face the Buccaneers. Last night, the Bucs beat Fargo 4-2 to move into a first place tie with Sioux City in the USHL western conference. The Bucs and Stars will play again next Tuesday, November 11th at the IceBox. they also said to keep your parking tickets so that you won't have to pay for parking at the rescheduled game. i don't believe this is related to the issue last night as i've noticed it since the season started, but has anyone noticed how the ice is kind of discolored? it's basically all over the ice - kind of a light red/yellow-ish color around the blue lines and several other places. does anyone know what that is or if it's something wrong with the ice? The discolored spots on the ice were caused by condensation forming on the inside of the roof of the IceBox and dripping down during the initial ice build. They put ice in earlier than they have in the past, so the warmer outside temperatures caused the condensation to form inside the IceBox. The inside roof of the IceBox probably isn't the cleanest, so the water dripping down was dirty/rusty. From what I understand, they'd have to tear the ice completely out and then rebuild to get ride of the stains. I'm not sure if that will happen at all during the season. It would be a lot of work to start over. Lesson learned for next season, I suppose.